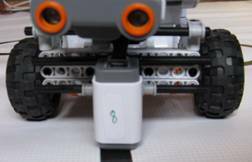 You have added a LEGO MindStorms NXT Color (LEGO’s spelling) Sensor to your robot, and you would like to use this sensor to follow a line. This tutorial will give you some hints about how to teach your robot to do this. 103.1 Line following with one Color Sensor. When your robot has one Color Sensor, to follow the edge of a line your robot is programmed so that the Color Sensor moved towards, and then away, from the line edge. · In the left-hand photograph below, we would like our Robot to move forwards so that the Color Sensor curves from the white surface towards the black line. · In the right-hand photograph below, after the Color Sensor has reached the black line we would like our robot to move forwards, so that the Color Sensor curves this time from the black line, back towards the white surface. We would like our robot to continue this left-and-right zigzag movement as it advances along the edge of the line. To achieve this, we could use an NXT-G program that looks like the one below. In the top motor line (red arrow), motor A is forwards about 50%, motor C is backwards about 20%. In the bottom motor line (blue arrow), motor A is backwards about 20%, motor C is forwards about 50%. The number of loop repeats (black arrow) is set to infinity. This worked for me, but the disadvantage is that there does not seem to be an easy way to calibrate the color sensor in “Light Sensor” mode. I have chosen “50” which is an average value for a room inside a house, as long as there are no bright streaks of light falling across the robot’s path. You will have to experiment to find a good value for your room. The program above followed the right-hand edge of the line. Because of this calibration problem, you may prefer to use the Color Sensor Mode. 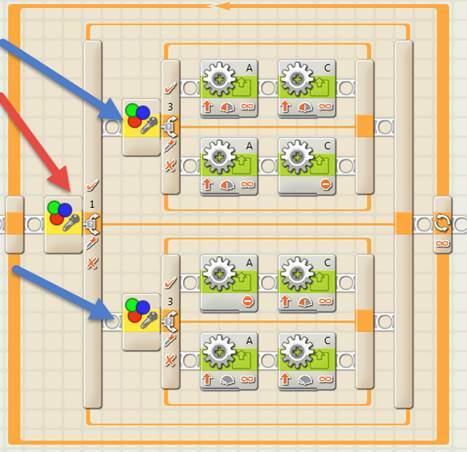 This also worked for me, however it is worth experimenting with both options to see which works best with your robot. The program above followed the left-hand edge of the line. N.B. 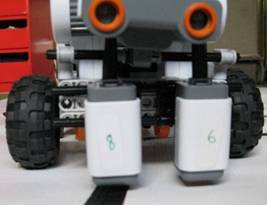 Depending on the orientation of the motors on your robot, you may have to reverse the motor directions in the sample programs shown above, otherwise your Robot may go backwards. Could we usefully modify the “one Color Sensor programs” shown above for use with two Color Sensors? The next step will be to add a second Color Sensor to your robot. There are many ways to do this. You could use hints from the video “Adding a second Light Sensor to Clarebot” seen here: http://www.drgraeme.net/DrGraeme-free-NXT-G-tutorials/ClareBotLight/default.html as a guide, or invent a way yourself. 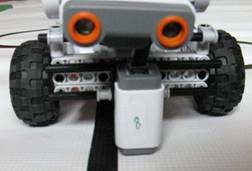 There are lots of ways you can mount two Color Sensors on a Robot – experiment and try your very own way to see if your way works and if your way is better than the suggestions above! 103.3 Programming your robot when it has two Color Sensors available. 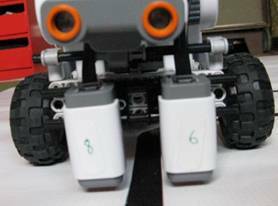 When you have added a second Color Sensor, your robot may look something like the robots shown below. Does this follow a line more quickly than our previous robot using just one Color Sensor? If it is better, how much faster is it? If it does not work, why is this not a useful program? HINT: To work out why it is behaving in the way it is behaving, follow through the program to see what happens in the cases of photos 1:, 2: and 3: above; (we can ignore photo 4: for a while). If you are having trouble understanding what happens in this program, call your mentor. When you feel you understand how this program works, try Programming Method 2 method to see if Programming Method 2 is better or worse than Programming Method 1. In this case we should think carefully what we want our robot to do when it comes across the circumstances shown above in photos 1:, 2: and 3: (ignore photo 4: at this stage). One possible way of programming this is shown below. 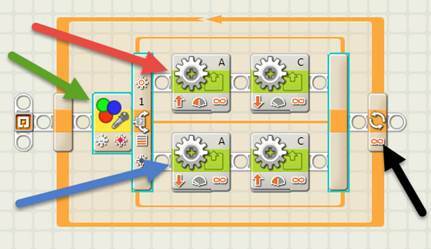 The Switch Control panels for RED and BLUE arrows are the same as shown in Section 103.3.1 of these notes. Can you work out what the program above does if both sensors see black (photo 4 above)? Also, this program is not the only way to represent the program diagram shown in section 103.3.1 above – can you think of a different way? How would your program be different to the program above? You could try varying the width between the Color Sensors – what difference does this make – does your robot go around corners more easily, or does it have more problems? 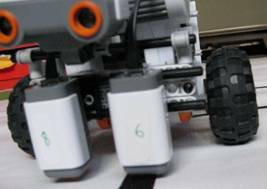 You could try varying the distance the Color Sensors are ahead of your wheels – what difference does it make if the sensors are a long way ahead, or even closer than you originally had them – does your robot go around corners more easily, or does it have more problems? You can see (photo 4 above) that the competition RoboCup Rescue mat has green areas as well as black and white. If your robot knows when it finds green, it can get a hint as to which way to turn to make its journey around the RoboCup competition mat both faster and shorter. 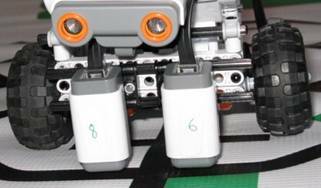 How could you program your robot to recognize green patches? A Microsoft Word 2003 5-page version of this Challenge can be downloaded by clicking here.